Another day, another batshit quote from the AFA's Bryan Fischer. In a blog post on the AFA website, Fischer serves up some ideas on fixing Obamacare. The post is titled, Bringing down health care costs so easy a caveman could do it. Apparently, Fischer is not aware that Neanderthals actually showed "a deep seated sense of compassion." People need medical care, you will say. Right. People need to eat, too. How long would a grocer stay in business if he was required to offer food to everyone who walked in the door regardless of their ability to pay? He’d be broke in a week, and then nobody would have food. The American people, because of the spirit of Christianity, are the most generous people on earth. There you have it. 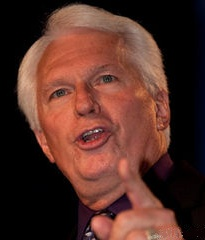 Bryan Fischer is not only a terrible human being. As I've stated over and over, he is also the world's least self-aware.